Splash pages, you gotta love 'em. A blank canvas where the artist can hit you with a large dose of illustrated 'wow'. This week, it's a splashie from an old corner of Marvel that needs to be revived, called Marvel Edge. It wasn't just 'Marvel Knights', it was all the horror comics thrown in to. 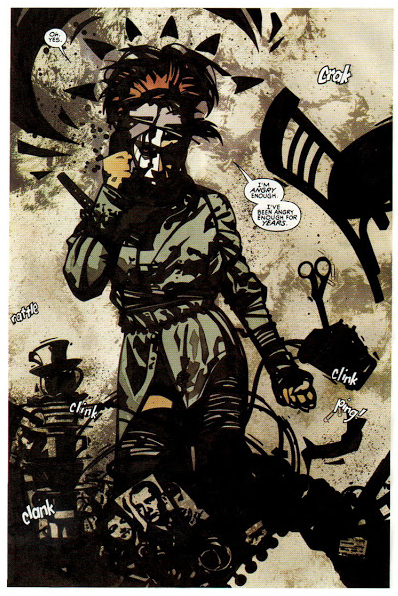 One of the brand's best moves; giving Typhoid Mary her own book by writer Ann Nocenti and artist John van Fleet. I've said it on this site a million times, but I really dig artists who wield black or ink in stylised ways. John not only created the perfect atmosphere for the character with this, he reminded me of John Paul Leon's amazing work on the Milestone titles and The Further Adventures of Cyclops and Phoenix for Marvel. Detective Dan? Hey me and Batman aye Dale? Or at 6ft3 were you meaning Elongated Man? Will see what I can find. Thanks for the comments! This is some serious work. I love the style. Nice splash Dan. Gosh I cant remember this Marvel Edge at all, that's a weird thing. I can only recall the Knights iteration, wish Id got into this. Cheers OA glad you dug it. Typhoid's one of the best characters ever so I'm glad I could show her a little respect. Karl, M.E. had a darker take on folks like Hulk, and Doctor Strange plus the usuals like The Punisher - except theirs worked for the mob! It was a great line and well worth looking into.